We survived Thanksgiving! If you follow me over on Instagram, you know that we went to San Antonio for Thanksgiving and ate lots of turkey and Puerto Rican Rice. If you follow me on Facebook you know we tried to teach Grandpa (my father-in-law) the ins and outs of Instagram. He is still not digging the idea of hashtags and has no idea why anyone would care what you ate with your Thanksgiving turkey. Matthew visited Santa at the Bass Pro Shops in San Antonio (hello, pics with Santa are free there). It was his first time ever to have his picture made with Santa without his siblings. He was a little nervous. We have no turkey leftovers- they were all gobbled up over the course of the days after Thanksgiving. Do you still have leftovers? How do you reinvent them? Turkey Pot Pie? Turkey Enchiladas? I would love to know! I have a delicious week planned for us. Here is what we will be cooking. Crockpot Ravioli with Crumbled Beef– I am taking my Crockpot Ravioli recipe and adding crumbled hamburger meat that has been cooked with Italian seasonings over top. I am not a fan of beef ravioli,but I thought this was a fun way to work in the beef without it being a pasta stuffed full of meat. Is that weird? Served with salad and rolls. Lime Butter Garlic Salmon– served with baked butternut squash and pearled couscous. Creamy Chicken Tacos– super easy and super yummy! Easy Beefy Bolognese– I love them! Served with bread and fruit. This recipe will be in my upcoming eBook that should be ready in just a few weeks. Yay! 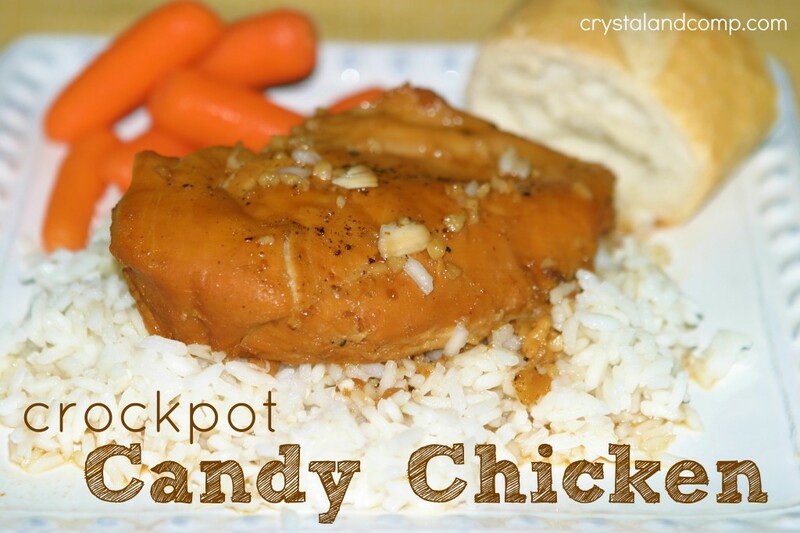 Crockpot Candy Chicken– served over rice with the best frozen veggies ever!